The Considerate Constructors Scheme is delighted to recognise Sainsbury’s achievement in being the only client to have had two sites in a row awarded the title of Most Considerate Site. Every year the Scheme recognises the UK’s most considerate construction sites at its National Site Awards. The National Site Awards are held over a number of ceremonies across the UK and recognise those sites that have made the greatest contribution towards improving the image of construction. At each ceremony, sites are presented with either Bronze, Silver or Gold Awards, but only one Gold Award winner will be presented with the title of Most Considerate Site of the year. The awards recognise the efforts that everyone involved with the site has made to be a considerate constructor, which includes the clients. 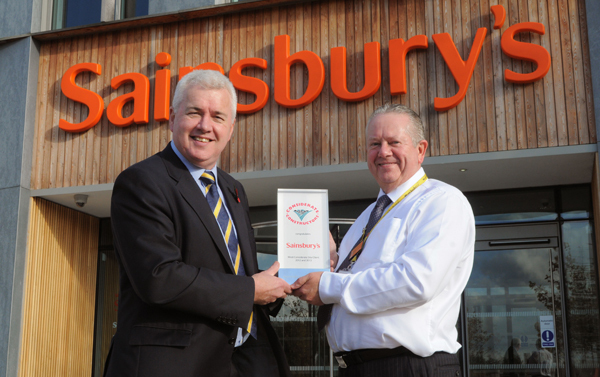 The first Sainsbury’s project to be awarded the title of Most Considerate Site was the refurbishment of their supermarket in Ballymena, Northern Ireland. The project was undertaken by McLaughlin & Harvey Ltd who were tasked to refurbish the store in 13 weeks. Sainsbury’s, who are also one of the Scheme’s Client Partners, understand the importance of considerate construction and so were very supportive of McLaughlin & Harvey and their goal in achieving the highest levels of consideration. One such resource Sainsbury’s offered was a dedicated community liaison officer who was able to connect with the local community and organise events and activities in a short space of time. Sainsbury’s also held events in-store for Comic Relief with site staff getting their chest and legs waxed and carrying out back-packing for the charity. Along with McLaughlin & Harvey’s efforts, this site raised the bar for considerate construction and was duly named as the Most Considerate Site 2012. Sainsbury’s then went on a year later to be the client who was awarded the Most Considerate Site 2013. This project was for a new supermarket constructed in Bognor Regis by Longcross Construction. As before, client support for the Scheme was exemplary with Sainsbury’s taking a keen interest in the contractor’s considerate activities. For Sainsbury’s to be named as the client for not one, but two Most Considerate Sites, it demonstrates their belief and enthusiasm for the Scheme and the aim of improving the image of construction. To mark this achievement, Scheme Chairman David Watson presented Richard Rust, Sainsbury’s Head of Construction Programme & Delivery, with a special award to commemorate their achievement. Sainsbury’s have been a truly supportive client to the Scheme and have been working tirelessly with contractors to ensure their projects are carried out with the highest consideration towards the community, the workforce and the environment. It is a pleasure to be recognising their achievement and we look forward to continuing our relationship with them into the future. We’re delighted to be recognised by the Considerate Constructors Scheme for two years’ running. We have a strong track record of working with the local community and businesses as part of our store development programme, and expect the same values of our contractors. Working with our contractors we ran local trader events and engaged with local businesses, a number of whom helped to deliver both the Bognor and Ballymena stores, and have since gone on to work on other Sainsbury’s construction projects. We’ve also extensively engaged with the local community creating over 700 jobs, and raising and donating thousands of pounds to local schools and charities. This is a great achievement for Sainsbury’s but more importantly for the communities where the supermarkets are located. They have benefitted from the very highest levels of consideration while the projects were under construction, and have now been left with supermarkets which have been fully-embraced by the community. This also demonstrates how important it is for clients to support contractors in their efforts, and the difference they can make to the success of the project with local communities.